The search for world-class architects, designers and developers to deliver four ambitious and iconic new HS2 stations began today with the publication of contract opportunities for station designs and a development partner for London Euston. The winning bidders will work with High Speed Two (HS2) Ltd to develop and refine the detailed plans for three brand new stations, at Birmingham Curzon Street, Birmingham Interchange and London’s Old Oak Common, as well as a major expansion of London Euston. 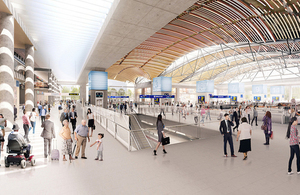 The stations will welcome tens of thousands of passengers every day from all over the UK, providing easy and accessible onward connections to local transport, airports and connecting rail services as well as step-free access from street to seat. In total more than 170,000 new jobs are expected to be created in the wider development areas surrounding the four stations. A separate contest, also launched today, will seek a Master Development Partner to advise on, and later take forward, development opportunities for new homes, offices and retail space above and around the revamped London Euston. The winner will work with HS2 Ltd, Network Rail, the station design contract winner and local authorities to deliver a unified plan to unlock the full potential of the area. This comprehensive approach has the potential to deliver up to 21 hectares of development space as well as improving accessibility and creating new public and green spaces across the wider Euston site. The search for design teams to produce plans for new stations and world-class amenities for London Euston, Old Oak Common, Birmingham Interchange and Birmingham Curzon Street stations is a major step towards making HS2 a catalyst for growth across the country. The winning bidders will need to ensure the stations provide the best possible customer experience. There are also huge opportunities for development near all the HS2 stations. HS2 Ltd is progressing its search for a partner to deliver new homes, shops and offices around Euston station once the core HS2 work is complete. We’re looking for the brightest and the best from across the industry to help us deliver one of the most tangible legacies of the HS2 project – three brand new stations and a major expansion of London Euston. All four present unique challenges and opportunities for the winning bidders. Together we will deliver world-class designs that help unlock wider local regeneration opportunities and provide unparalleled levels of accessibility, ease and convenience for the travelling public. Euston has been the gateway to the nation and the nation’s capital for over a century. HS2 provides the opportunity for it to continue that role into the next century - and for the local community to be proud of that role. Together with our development partner, we aim to redevelop Euston in a way that will make it not just the nation’s hub, but London’s as well, the heartbeat of both the nation and the capital, fit for the 21st century and beyond. Network Rail welcomes the opportunity to create a new London destination at Euston mirroring its neighbour King’s Cross and St Pancras where our investment in the station acted as a catalyst, bringing inward investment and regenerating the whole area into a thriving new London quarter. The HS2 terminal at Euston will have a similar effect, it will become the initial focus for the wider regeneration of the station and surrounding area with an opportunity to create a new vibrant commercial and residential district in the heart of London with fantastic connectivity to the rest of the UK and Europe. Bidders for the station designs and the Euston Master Development Partner are expected to be shortlisted in the summer, with contracts signed early next year. The station design work will be split into four packages.